Because of my small, chinky eyes, lining my eyes will always be the way to go to create that complete and wide-awake look! I know I don't wear as much eyeshadow as I used to 10 years ago but I definitely will keep that eyelining game strong at present and for the years to come. That said, I've been using, and testing, both drugstore and high end eyeliner brands and today, I am featuring the one from Guerlain called Guerlain L'ART DU TRAIT Precision Felt Eyeliner in 01 Ultra Black. Housed in a pen like most liquid liners, you get a clear print of the Logo of Guerlain in Gold on top of a black pen. Very chic! The felt tip is long, making it easy to create precise liner looks. I am surprised on how nice the color pay-off is! I wasn't as impressed on swatch but it was amazing on my eyes. Water-resistant formula, so far, didn't run on me until makeup removal. Dries up pretty quickly upon application. I can open my eyes almost immediately after application. Very easy and convenient to use especially for Pro MUA like myself, this applies like a dream. No tugging needed, you get ultra black line in just a single application. Price because there are so many inexpensive brands out there that works just as good. Only 1 shade available, I'd love to use a Dark Brown liner on a daily basis. A highly pigmented liquid liner that has a longer felt-tip marker making it easier to control the eyeliner looks you prefer. Dries up pretty quickly upon application and lasts the whole day for users with normal or dry lids. Always shake with cap close before you apply. Best to apply using the "flat portion" of the brush to create lines and wing using the tip of the brush. Apply with light hand and lessen pressure to prevent tugging. Never apply on lower lashline or waterline. Best liner to be used when you want to apply eyeliner on top of false lashes! The length of the brush applicator is perfect to do so. For those who really take eyelining a serious business! If you want graphic-looking liners or really thick liners, this is the way to go because this is so easy to use! At local Guerlain counters priced around Php2,400. For application, I like to use the "flat" portion or "sides" of the brush in creating line close to the upper lashline. Using the tip, I use it to create a "border" for my winged liner looks and gently fill in. The tip is sharp enough to create the perfect wing! The Guerlain L'ART DU TRAIT Precision Felt Eyeliner is indeed very easy-to-use (almost fool proof)! The liquid eyeliner is pigmented enough you get Ultra Black shade in just a single swipe. 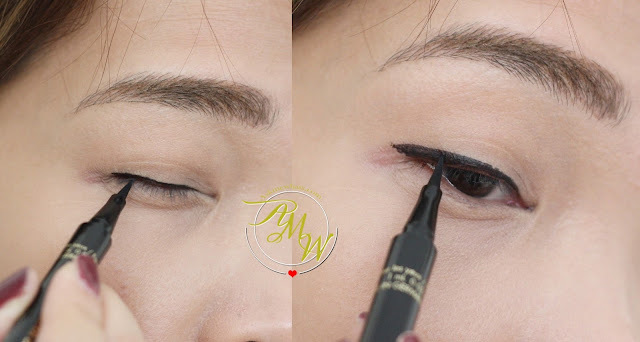 All you need to do is gently fill in the liner close to the upper lashline, and maybe, if you have a hard time doing so, tightline using a waterproof eyeliner pencil of choice. How do you feel about Guerlain L'ART DU TRAIT Precision Felt Eyeliner? Whoa it looks matte on photo but since Lifeford all I can say for this is "Whaat 2k?"